Two superb goals saved the day for City, after they’d struggled to break down a well-drilled Sunderland side. Manuel Pellegrini welcomed back Sergio Aguero, who partnered Edin Dzeko upfront. Samir Nasri was selected on the right, with Aleksandar Kolarov at left-back. Costel Pantilimon continued as the ‘cup’ goalkeeper. 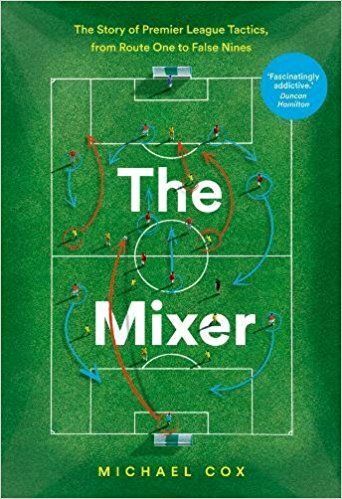 Gustavo Poyet dropped striker Jozy Altidore from the squad and pushed Fabio Borini upfront, with Sebastian Larsson coming into the side, while Wes Brown returned after suspension and Lee Cattermole replaced the cup-tied Liam Bridcutt. Sunderland’s starting approach worked nicely and they responded impressively after going 2-1 down – tactically, they deserve great credit for this performance. Both sides played as expected – City in a narrow 4-2-2-2 system with the wide players coming inside, Sunderland in a defensive-minded 4-1-4-1 system. The closest thing to a surprise was the use of Jack Colback in a narrow left-sided midfield role and Larsson in a more central position, but this changed little in terms of Sunderland’s overall approach. The pattern of the game was expected, too, with City dominating possession and Sunderland looking to counter-attack quickly, primarily through Borini and Adam Johnson. Sunderland’s early lead meant this pattern became more obvious. Poyet’s major selection decision was upfront, and the performance of Borini justified his choice. Altidore had been extremely poor at Arsenal last weekend, barely holding up the ball and showing little understanding of how to play against two centre-backs, remaining high up in central areas between them, rather than dropping deep or moving wide. Poyet switched to a system with Borini upfront at half-time of that 4-1 defeat, which was possibly an experiment for this match. 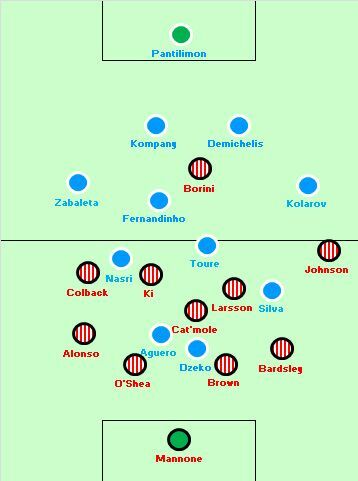 Borini interpreted the role in a different way to Altidore, starting his runs from the channels, rather than between Vincent Kompany and Martin Demichelis. He usually played towards the Argentine’s side, dropping deep to bring him up the pitch – a position Demichelis is uncomfortable in – then sprinting in behind. The option of Johnson on that flank, too, caused Demichelis and Kolarov problems, and a few times Sunderland simply chipped balls into that zone and waited to see what happened. Borini’s runs were excellent, and the opener summed it up. His movement was very intelligent, his pace took him past Demichelis, and he got the better of a challenge with Kompany, attempting to sweep up behind. His finish was sublime. He also had Sunderland’s best chance at 1-0, when he darted in behind but was halted by a Kompany tackle. The Italian was realistically Sunderland’s only goalscoring threat. Poyet ordered his side to defend extremely narrow, with Colback naturally tucking inside to become an extra central midfielder – this sometimes allowed Marcus Alonso to fly forward on the overlap. Sunderland seemed happy to allow Pablo Zabaleta freedom on the ball. On the other side, Johnson was more advanced, but David Silva played extremely narrow rather than utilising the potential pocket of space towards that wing. Silva was often nullified by Cattermole, who played a crucial role in both phases of the game. He stayed in extremely deep positions to help the centre-backs deal with the movement of City’s front two, but when City played the ball into the final third he sometimes seemed to be tracking Silva across the pitch, too. Cattermole was also useful in possession because City’s press was poor – often the front two closed down the centre-backs, then no-one was backing up to shut down Sunderland’s holding midfielder, and the underdogs enjoyed longer spells of possession than expected towards the middle of the first half. Possession was only 55-45 (in City’s favour) after 23 minutes. Sunderland’s possession play was actually quite dangerous, however, because City were more threatening when they had space to break into. One burst down the right from Aguero on the counter-attack was a rare moment of excitement from the Argentine forward. When trying to break down a packed Sunderland defence, City suffered because they had little natural width. It was hugely surprising that Pellegrini picked Nasri and Silva on the flanks, both moving into the centre of the pitch, because this wasn’t really a game that required two passers in wide zones. That format makes sense in matches that are based around a possession battle, but here they needed more vertical running. Besides, their possession share wasn’t particularly impressive anyway. In truth, this was the same mistake Roberto Mancini made in last season’s FA Cup final, where the narrowness of Nasri allowed Roger Espinoza continual freedom down the left, and meant City offered little depth to their play. Here, it would have been more useful to have Jesus Navas giving a different option to provide crosses, and stretching the Sunderland side, creating gaps for others to play through. Basically, City won this game with two moments of individual magic – Yaya Toure’s amazingly nonchalant 30-yard chip into the top corner was literally unstoppable, and a complete game-changer. It’s not as if City were enjoying a particular spell of pressure before this, although they did pass the ball more quickly after half-time. A snapshot of the pitch at the moment of Toure’s strike actually shows City’s problem quite well – four attacking players all in narrow positions, high up against the Sunderland backline. Toure’s glorious goal bypassed them all. A minute later Nasri’s brilliant swerving shot put City in front – here the defending was more questionable, but it was another superb goal. Navas made sense tactically, Nasri was more likely to contribute something like that. It’s also worth considering the fact Sunderland got carried away after City’s equaliser, and found themselves attacking with multiple players inside City’s third. When Costel Patilimon thumped the ball downfield, Sunderland had to scramble back and take up their defensive positions hurriedly, but were still very disorganised as Kolarov crossed. When they had men behind the ball, they were never opened up. Pellegrini immediately introduced Navas for the half-fit Aguero, with Nasri becoming the number ten. Poyet reacted immediately after Nasri’s goal with two changes – Steven Fletcher and Craig Gardner replacing Johnson and Larsson. Sunderland were now a narrow 4-4-2, with Borini and Fletcher upfront. They continued to compete in the centre of midfield and also offered a goal threat, and put pressure upon City’s backline. This was mainly through set-pieces: often free-kicks won inside the City half because of needless fouls, as Pellegrini’s side looked nervous defensively, and a succession of throws in deeper positions. 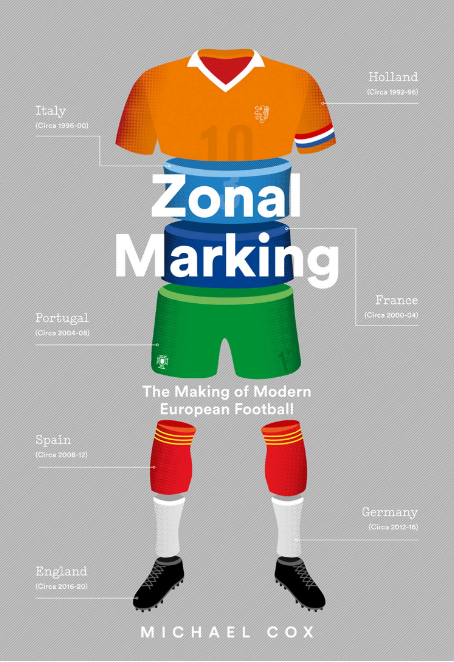 The ‘action zones’ of the 90 minutes (with City the ‘home side’ here) shows a well-balanced contest. Sunderland became more adventurous with Emaunele Giaccherini on for Cattermole, while Pellegrini shored up his midfield with Javi Garcia replacing Silva. 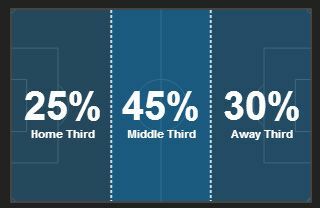 The majority of the last hour hour was played in City’s half, although the closest thing to a proper chance was when Fletcher foolishly tried to bring the ball back onto his left foot after finding space following a set-piece. He found space because Toure simply couldn’t be bothered to defend – as magnificent as his equaliser was, his lack of defensive work rate in the closing stages is simply appalling at times. Still, Toure assisted the clinching goal, finished by Navas. Sunderland conceded the third because they’d been desperately attempting to score the equaliser, and were caught 2 v 5 at the back in the final minute. Tactically Sunderland emerge from this match with more credit than Manchester City. Their starting plan was excellent: they thwarted City defensively and Borini played the lone striker role superbly. They also responded well to going 2-1 down, and put constant pressure upon City in the second half, although failed to genuinely test Pantilimon – arguably because they didn’t really have a creative player on the pitch. City emerged victorious, primarily thanks to two genius strikes from Toure and Nasri, but this was a much closer contest than expected. It was an excellent cup final, but not a particularly fine performance from the victors. how puzzling that Pellegrini’s sides never seem to have any strength in defense, being that he himself was a centre-back (a Terry Butcher type of player, slow but tough). With all that cash to splash, he brings in Demichelis…I just can’t see Man City winning anything of importance wthout a truly solid centre-back pairing. Kompany may be classy, but you need at least one CB to be solvent and ruthless. you quite correctly pointed out about the city’s narrowness . the thing is on the offense silva and nasri both came inside which created narrowness and it played in to sunderlands hands . they could have more men in the middle of the pitch . leaving city with little space to explore . now what i would had liked is city had dzeko upfront and is very good in the air and sunderland had brown and o’shea as the centre .i am not sure about brown and o’shea and i thought that dzeko had good chance against them out jumping them . now if city had stayed wide and put some aerial crosses then what it would had achieved is that sunderland would had to come out wide to stop crosses . which would had allowed more space for silva and toure to explore . because of nasri and silva’s narrowness toure had to play a very conservative role .he couldnt make his runs in the box for which he is known . overall till navas’s substitution city played into sunderland’s hand . but then the inevitable was there but most importantly sunderland players were not afraid in one on one situations like man utd’s carrick ,cleverly and young . they were good on the ball and at times passed the ball equally better . can we just some pics while we comment because it would be better to explain out point quite nicely .